(Steve Griffin | The Salt Lake Tribune) The city of Provo's attorney, Heather White, of Snow, Christensen and Martineau, is filing a response to the lawsuit that was recently filed against the city by several women alleging sexual harassment and assault by former Police Chief John King; the lawsuit also alleged that former mayor John Curtis and city officials ignored complaints about King. White addressed the media during a news conference at Snow Christensen & Martineau in Salt Lake City Thursday April 19, 2018. (Steve Griffin | The Salt Lake Tribune) The city of Provo's attorney, Heather White, of Snow, Christensen and Martineau, is filing a response to the lawsuit that was recently filed against the city by several women alleging sexual harassment and assault by former Police Chief John King; the lawsuit also alleged that former mayor John Curtis and city officials ignored complaints about King. White addressed the media during a news conference at Snow Christensen & Martineau in Salt Lake City Thursday April 19, 2018. (Steve Griffin | The Salt Lake Tribune) The city of Provo's attorney, Heather White, of Snow, Christensen and Martineau, is filing a response to the lawsuit that was recently filed against the city by several women alleging sexual harassment and assault by former Police Chief John King; the lawsuit also alleged that former mayor John Curtis and city officials ignored complaints about King. White addressed the media during a news conference at Snow Christensen & Martineau in Salt Lake City Thursday April 19, 2018. (Steve Griffin | The Salt Lake Tribune) The city of Provo's attorney, Heather White, of Snow, Christensen and Martineau, is filing a response to the lawsuit that was recently filed against the city by several women alleging sexual harassment and assault by former Police Chief John King; the lawsuit also alleged that former mayor John Curtis and city officials ignored complaints about King. White addressed the media during a news conference at Snow Christensen & Martineau in Salt Lake City Thursday April 19, 2018. (Steve Griffin | The Salt Lake Tribune) The city of Provo's attorney, Heather White, of Snow, Christensen and Martineau, is filing a response to the lawsuit that was recently filed against the city by several women alleging sexual harassment and assault by former Police Chief John King; the lawsuit also alleged that former mayor John Curtis and city officials ignored complaints about King. White is reflected in a conference room glass topped table as she addresses the media during a news conference at Snow Christensen & Martineau in Salt Lake City Thursday April 19, 2018. (Steve Griffin | The Salt Lake Tribune) The city of Provo's attorney, Heather White, of Snow, Christensen and Martineau, is filing a response to the lawsuit that was recently filed against the city by several women alleging sexual harassment and assault by former Police Chief John King; the lawsuit also alleged that former mayor John Curtis and city officials ignored complaints about King. White addressed the media during a news conference at Snow Christensen & Martineau in Salt Lake City Thursday April 19, 2018. After five women filed suit last month, alleging sexual misconduct by Provo’s former Police Chief John King — and inaction by officials who they say could have stopped it — the city responded Thursday by saying their claims were not based in reality. Provo’s formal response to the lawsuit, filed Thursday in federal court, makes a number of technical defenses. In essence, the city denies discriminating against the women, who were either city employees or volunteers at the time. The five women say they were the subjects of unwanted sexual advances during the chief’s three-year tenure in Provo. King was forced out after allegations of sexual assault were made by a department volunteer in early 2017. The case was filed in 4th District Court in March and was transferred to U.S. District Court this month. The women also say city officials including then-Mayor John Curtis — now a member of Congress — enabled the chief’s behavior and ignored complaints about him. In fall 2014, Curtis called a meeting with police supervisors regarding complaints about King and said King would remain chief as long as Curtis was mayor, the women say. But Curtis has said that events at that meeting were misconstrued, and that it actually was called to discuss unrelated concerns about King. The women seek an unspecified amount of money in damages as well as changes in city policy, including implementation of harassment and discrimination training for police and mayor’s office employees. The Salt Lake Tribune generally does not identify victims of sexual assault. 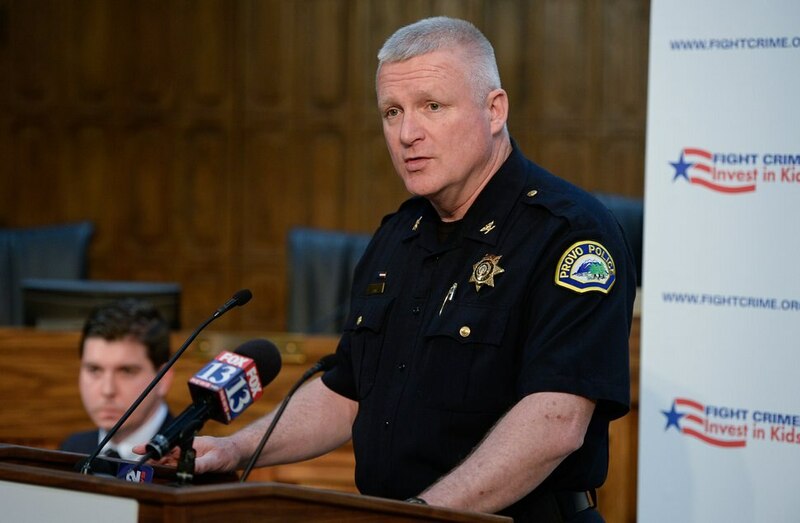 A Thursday statement from the women’s attorneys expressed disappointment that Provo had opted to continue litigation, rather than taking “responsibility and accountability” for the actions of its former police chief. The first allegation, White said, came from a police dispatcher, who told her supervisor in July 2014 that King made her uncomfortable by staring at her chest. White said the city’s human resources department launched an investigation and learned more details about the alleged harassment, and King denied the allegations. She said Curtis then told King to stop the reported inappropriate behavior. A second report about King came from a September 2015 survey of city employees. One employee had reported that King “has boundary issues with touching female employees,” according to White and the city’s response, and a subsequent survey of police dispatchers came back with a similar complaint about King touching a dispatcher inappropriately. “Ask him to stop any touching,” Gary Bushman, then the city’s human resources manager, wrote to Curtis in an email obtained by The Tribune through a public records request. Bushman also recommended that Curtis have King retake the city’s online sexual harassment training within 30 days. Documents show that Curtis forwarded the email to King a week later. The survey results included a remark from the dispatch employee. “If it was another officer I wouldn’t have a problem, but because it’s the Chief of Police I don’t want to make waves,” she wrote. “Just seeing his unwillingness to listen to other people when implementing the beat plan and seeing his refusal to listen to other people’s suggestions, makes me feel like there would be retaliation if I reported him. White said the steps Curtis took to require King to take sexual harassment training, while “reaffirming that physical contact with employees was prohibited,” were the correct steps for the mayor to take, considering the circumstances. The third report of misconduct, White said, was from the department volunteer who came forward in February 2017 to say King had sexually assaulted her. Curtis relayed the report to the appropriate authorities, White said, and ultimately asked King to resign as an investigation took place. Charges were never filed. White said remaining complaints in the lawsuit weren’t brought to the city’s attention until after King resigned. When those allegations came forward, she said, the city reported them to the Utah County Sheriff’s Office for investigation. Curtis laid out a similar timeline of the three misconduct reports — after initially saying he only recalled two of them — in an interview with The Tribune last month. A Curtis spokeswoman did not respond to a request for comment Thursday. King has not yet filed a response to the lawsuit. But Loren Weiss, an attorney for the law firm Ray Quinney & Nebeker, said he expected to soon be retained by the former chief, who is now living in Maryland, where he had lived before Provo. The city “thoroughly and thoughtfully investigated” the allegations against King, its attorney said, and the investigations resulted in recommendations on how to improve the city’s program for addressing such harassment and discrimination complaints. “This is entirely inconsistent with the culture of fear and retaliation the plaintiffs try to present,” White said. White was asked Thursday whether the city should have taken the complaints about its chief more seriously — and doled out a harsher reprimand after the first two.